• Beneficial properties for mental disorders. 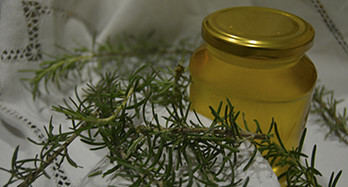 Rosemary honey is a food rich in lithium. Lithium is a very common chemical element in medications and drugs that is prescribed to combat various mental disorders, as for example is the case of the manic depressive disorder, bipolar disorder, depression and bipolar disorder. • Antiseptic, pectorals, and balsamic properties that are well suited to combat colds, bronchitis, coughs and colds. • Hepatic purifying. It increases the amount of glycogen available in the liver, exerting a decisive protective action of the liver. • It is emmenagogue (promotes menstruation), stimulant and antispasmodic. To keep this food's natural qualities for a long time it is necessary that your container is properly locked and keep in a dry place protected from direct sunlight. Pure honey solidifies (crystallizes) when the temperature drops below 20 ° C during time. To retrieve their liquid texture is recommended to put jar to the bath maria and stir. This feature confirms the purity of the honey. Honey quality, without pretreating. Bottled directly from the hive with health registration. Honey natural or raw, without pasteurization or microfiltration, processes that transform the honey into soft and liquid but varies its composition and properties. Tip: Rosemary honey is characterized by its high content of lithium. A spoon from Rosemary honey daily(in tea, with milk), will help prevent the onset of senile diseases, fight depression and lack of memory, as well as mental fatigue.